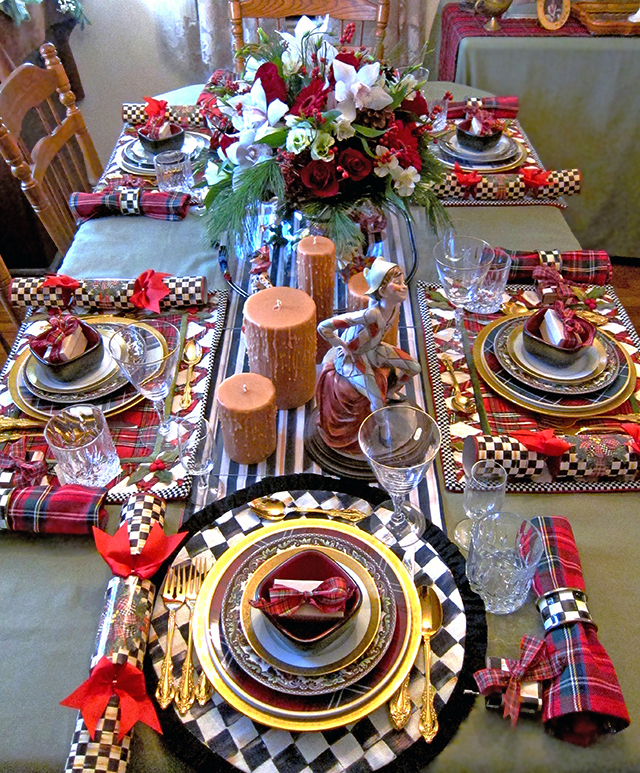 You are here: Home / Winter / Decorations / “Let’s Play!” Whimsical Yuletide tablescape featuring MacKenzie Childs! Late December seasonal celebrations offer unique challenges as well as opportunities. As the winter solstice approaches the amount of daylight dwindles. Historically this often proved frightening, and many ancient seasonal celebrations aimed to use fire to coax back the sun. Although we no longer fear this natural cycle, it can still create an energy of uneasiness. Many are affected by the increasing lack of sunlight and the seeping chill in the air. Celebrating this season, however, offers the unique opportunity to unite with friends and family and create our own warmth and light as we support one another and indeed laugh, even through the darkest day. With the idea of actively choosing joy, I created this holiday table. It is designed to accentuate the natural colors of the season with a touch of black representing the prevailing lack of sunlight, but then to turn these elements on their toes with whimsical patterns and frolicking harlequins that invite us to face fear and choose to play! Specifics are listed below. Enjoy! 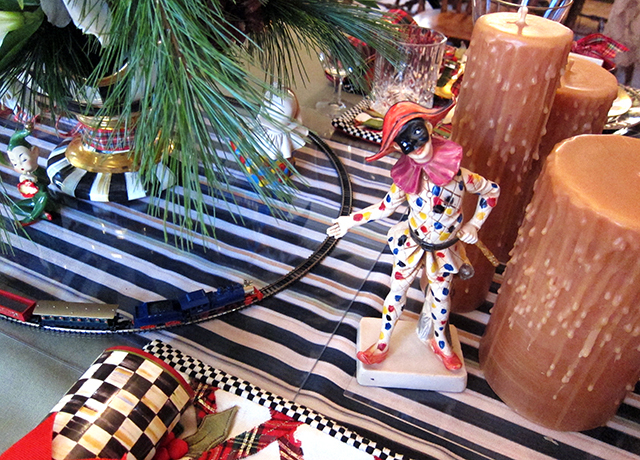 Why harlequins, Mackenzie Childs, and a train? Harlequins: Harlequins evoke contradiction. On the one hand, to some their mysterious masked faces and odd costumes trigger a deep-rooted fear that accompanies ambiguity and the unknown. On the other hand, they ask us to actively look for joy. And their anonymity means they could be anyone. They could even be us. They are the entertainers, sometimes perhaps the fools, putting themselves out there to try to coax a smile. It is their active pursuit of delight in the face of fear that makes them very meaningful symbols in our efforts to choose to focus on the spark of playfulness even amidst the darkness and chill and to help our loved ones to do the same. Mackenzie Childs: I fell in love with Mackenzie Childs creative art from the moment I laid eyes on it. Their elegant quality serving pieces and linens wrapped in delightfully striped and checked patterns, and even their playful take on tartan, seemed like the perfect fit to help manifest the whimsical spirit I sought for this design. Train Set: I also included a miniature fully functional electric train set on my table. This was by no means an easy feat. It was important to me, though, because it was yet another very active (quite literally) symbol of joy and playfulness. Even the challenges that this design element represented (creating a stable base, minimizing noise, and hiding any wires) seemed in tune with the challenges of the season itself. The results, however, were well worth it, full of surprise and fancy for all! 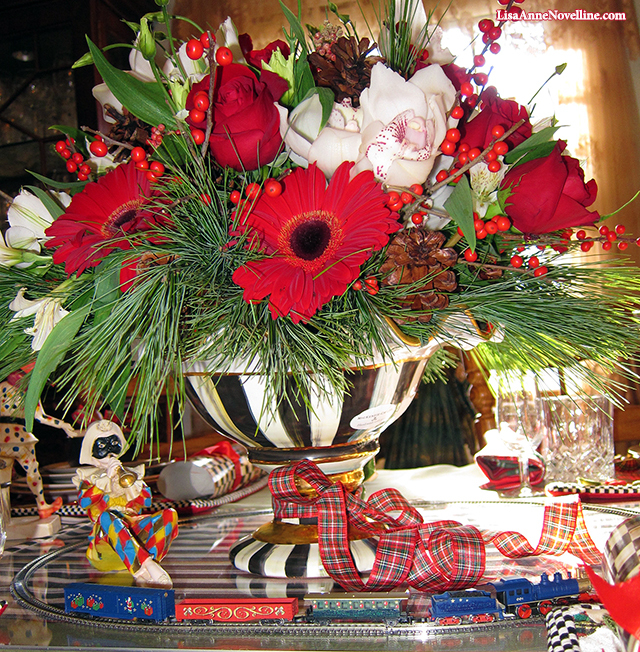 Floral Arrangement: A lovely seasonal floral arrangement sits nestled in a gorgeous 26 oz. MacKenzie-Childs Courtly Check Fluted Ceramic Compote purchased from ebay and wrapped with a tartan ribbon. I searched high and low for the best train for the job and decided on the Marklin 81846 Z Scale Christmas Starter Mini Electric Train Set, purchased on ebay. It was small, very low on noise, and tastefully decorated with seasonal embellishments. Underneath it, I placed a thin, plexiglass tray, cut at a local hardware store, to allow the train the stability its finicky nature required while not interfering with the overall look of the design. (I also placed one of these trays underneath each side vignette to protect the runner from dripping candle wax.) Wires were hidden underneath the runner and placemats, then taped to the underside of the table. Vintage, gilded, Minton Porcelain purchased used on ebay… and oh such a deal! Tartan salad plates from Williams Sonoma. Spode Woodland Grove purchased on eBay. Vintage, gilded, Mintons Porcelain Dessert Plates. CorningWare Ryku Red and Black Stoneware Ramekin. Flatware: 1969 Gold, electroplated flatware, purchased on eBay. Flutes: Petite, European crystal, purchased on eBay. Table Cloth: Huddleson Linens Sage Olive Green Pure Linen Tablecloth, purchased on Amazon. 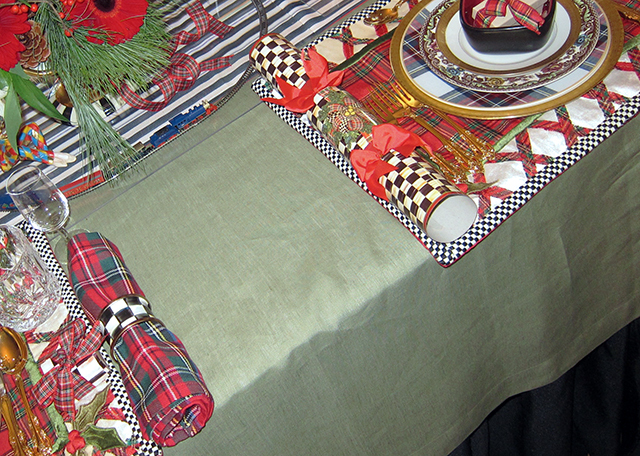 Table sides: Mackenzie Childs Tartan Yuletide Placemats, purchased on ebay. 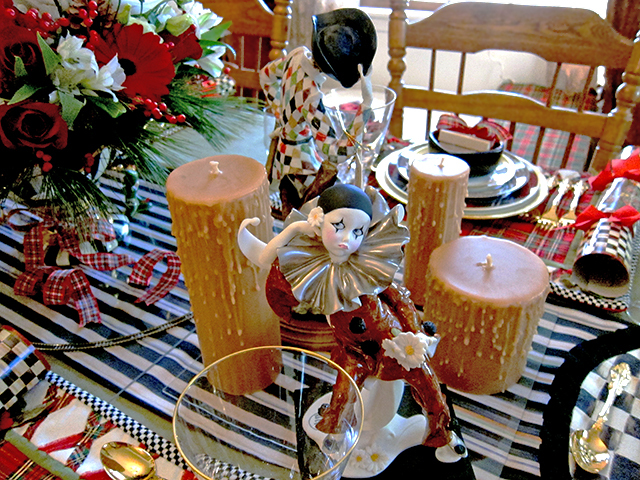 Table heads: MacKenzie-Childs Courtly Check, Ruffled Round Placemats, purchased on ebay. 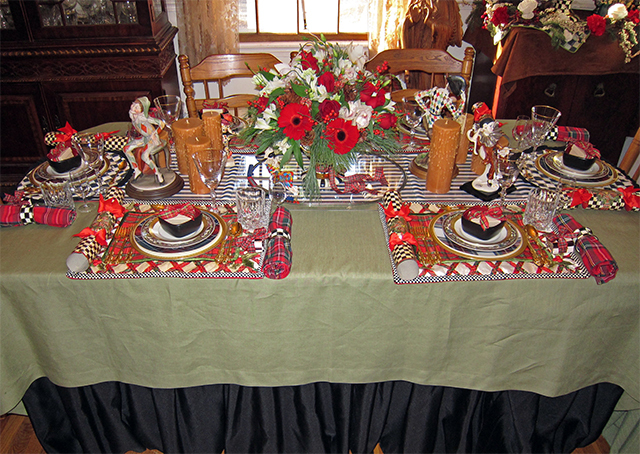 Table Runner: MacKenzie-Childs Courtly Check with Courtly Check poppy red trim, purchased on ebay. Napkins: Well Dressed Home tartan napkins, purchased on ebay. Napkin Holders: MacKenzie-Childs Courtly Check Enamel Napkin Rings, purchased on ebay. Hurdy Gurdies: These timeless mini music boxes have been an instant guest favorite at my celebrations for years. 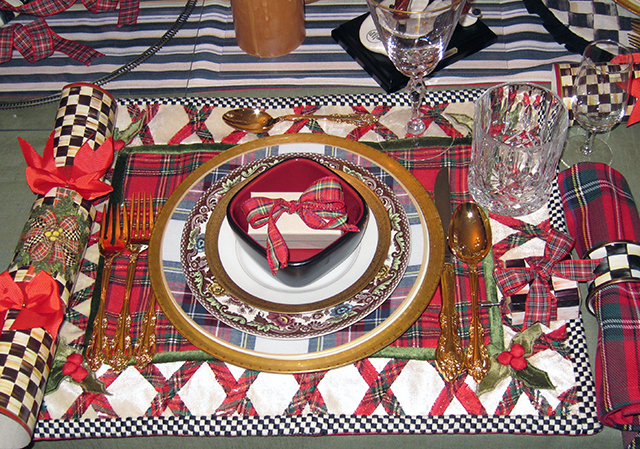 They are available at Victorian Trading Co. For this table setting, I used the Holiday Hurdy-Gurdies and wrapped them in Mackenzie Childs Courtly Check Gift Wrap and a tartan ribbon bow for further personalization. Burdick’s Chocolate Mice: I love offering small but amazing gifts to every diner, and Chocolate Mice: 2 Pack Mouse Samplers made by L.A. Burdick Handmade Chocolates perfectly fit the bill, and that’s actually underselling them. They are delicious, adorable, and have become a treasured tradition. 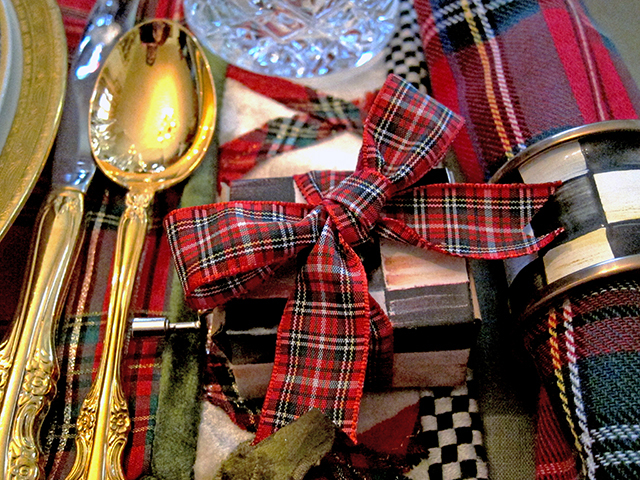 They come table-ready and wrapped with a bow, but I decided to personalize them and further tie them into the design, so I swapped the ribbon with my own tartan selection. May your holiday season be filled with light, warmth, and the joy of play!